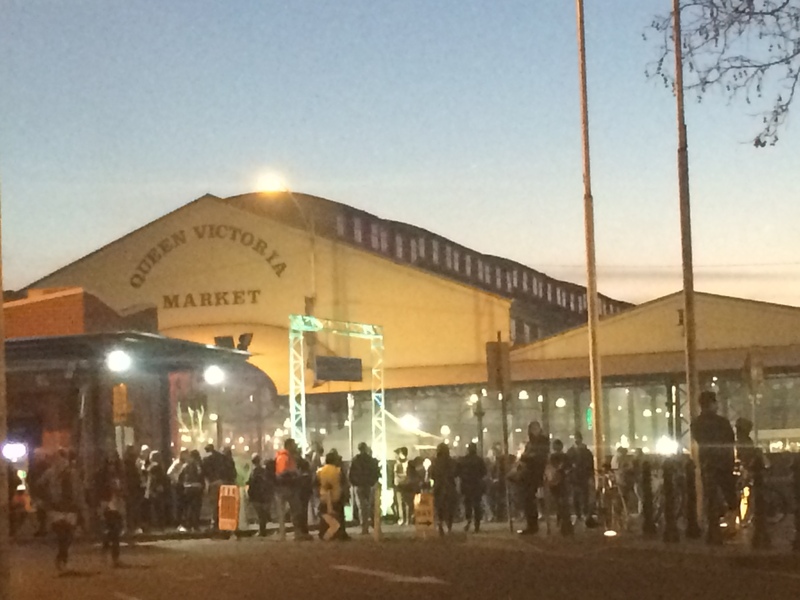 The Wednesday just passed (27th August) concluded Luna 1878, the winter night market held at the Queen Victoria Market. 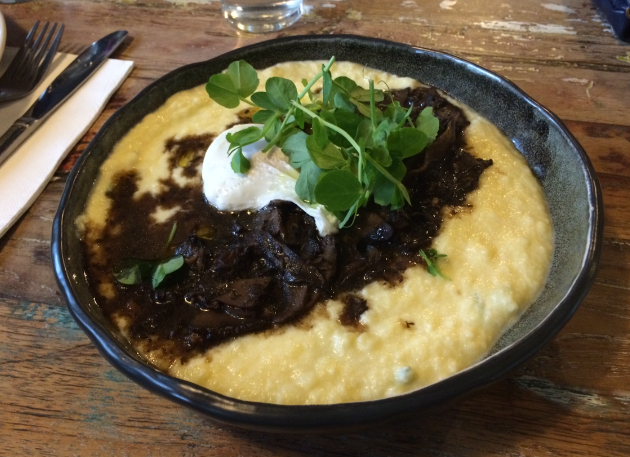 During winter it’s hard to find the motivation to leave your warm heated house but with a range of winter comfort foods on offer it makes it easy to trade your warm blankie in for a night out. There were lots of amazing foods available but being limited to the space of one stomach, I had to carefully decide which foods I wanted to try. Hammer and Tong had a stall where they were serving duck waffle, onion rings and crispy pork ears. We ordered the onion rings and they were fricken amazing! They were really crunchy on the outside, doughy in the middle and the onion melted in your mouth. 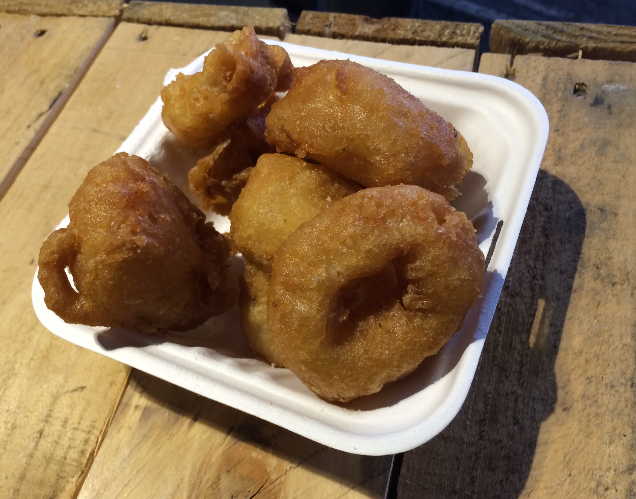 They were like little onion ring crispy donuts they were so delicious! The guys at the stand let us try the crispy pork ears, they were little bite-sized pieces, you could eat them like chips. I was hesitant to try them but they were actually yum, they were bacony and a bit like pork crackle but chewier. It would definitely be a good beer snack. Max (the frenchie) would have definitely ordered these if he was here, it’s right up his alley. 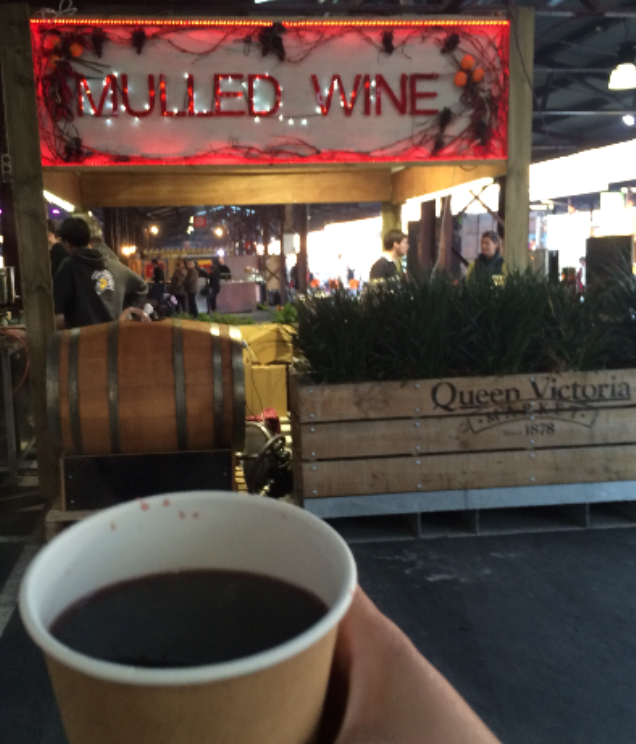 I hadn’t tried mulled wine before so I decided to give it a go. Seemed like the perfect beverage for a warm winters night. It was served hot and had an interesting flavour. It sort of tasted like a Christmas pudding liquefied and transformed into a hot drink. 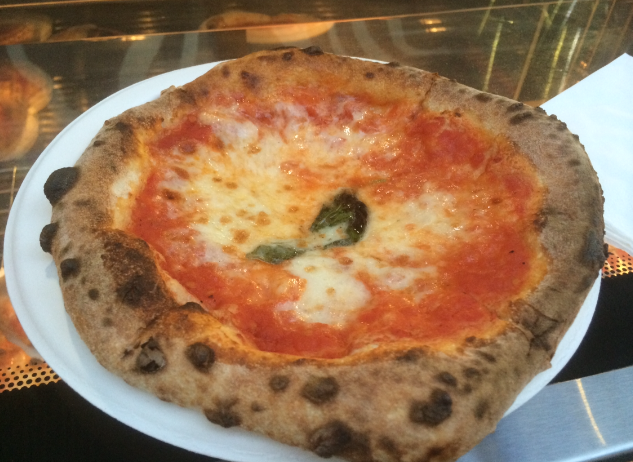 400 Gradi was recently voted the ‘world’s best margherita pizza’ at the pizza world championship. Now that is an impressive title – Best in the world! So on that basis we ordered one of the world-renowned margherita pizzas. It was delicious, the base was light, the sauce was yum, there was a good amount of cheese and the bites with fresh basil were incredibly tasty. Definitely a winner. We ordered roti from the Mamak stall. They make the most amazing roti and it’s fun to watch them make it. It is so light and fluffy and you can see why. They stretch the dough out until its paper-thin and then trap large amounts of air inside (they look like little roti parachutes) and then they grill them to get them crispy on the outside. It’s so delicious. 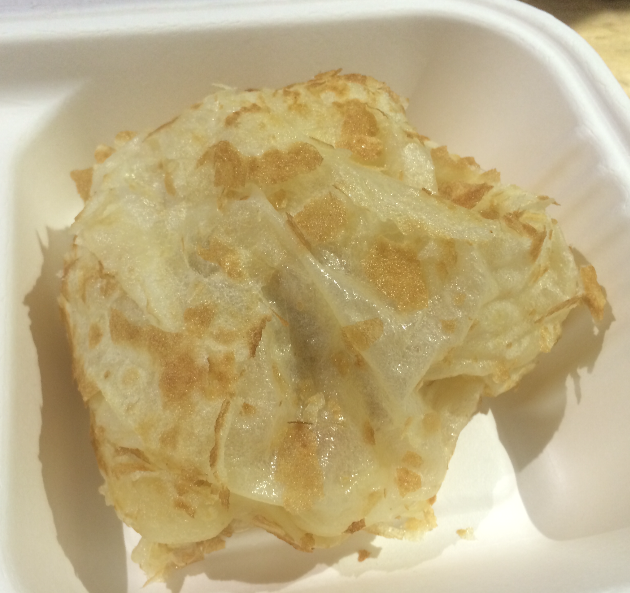 The roti canai came with Malaysian curry and a spicy sambal to dip it in which was delish! At the Spanish Gourmet Caterers stall they had ginormous pans with couscous in a tomato based sauce with big pieces of assorted seafood. It looked fantastic. 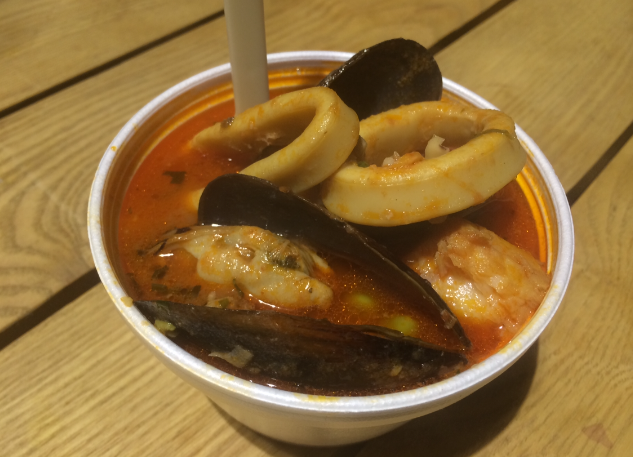 We ordered a bowl, which had a generous amount calamari, mussels and fish and the couscous soaked up the lovely flavours of the sauce. 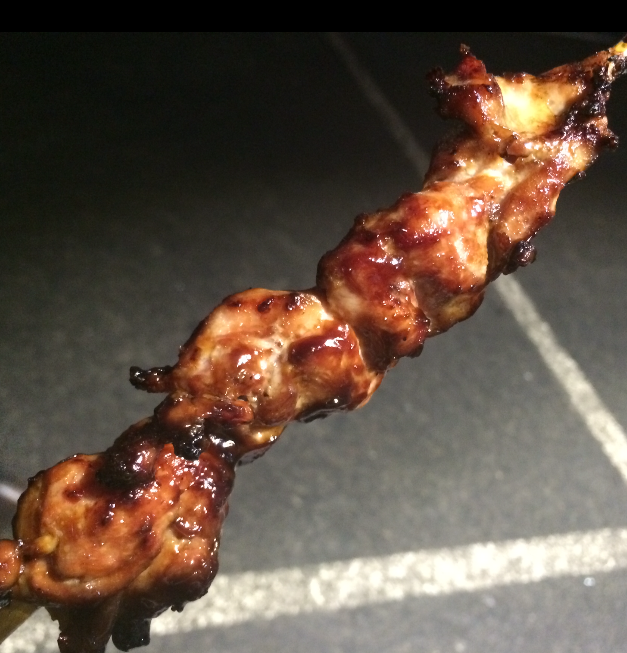 We got a chicken skewer from Hoy Pinoy, which was juicy and delicious. They also had a lechon stall where they had meat on the spit roasting. I love lechon (roasted suckling pig) but I don’t know if I like to see five pigs rotating over a fire. For some it can be quite confronting. And it was right next to the vegetarian street food cart. What the? Right next to the vegetarian stall? I found it very odd to have the vegetarian stall positioned next to the spit roasts. Ah wells. 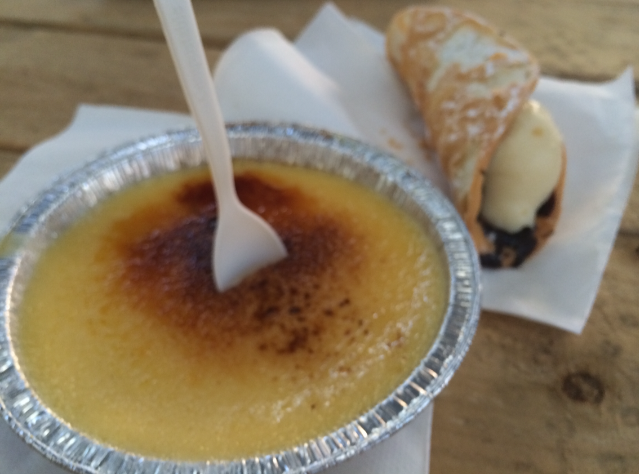 From the Crème Brulee Cart we ordered a…yep you guessed it, a crème brulee. It was deliciously creamy and not too eggy, it had a crunchy bruleed top and had a strong vanilla flavour throughout. It was delish! I wanted to buy the whole cart. Also the vanilla cannoli was really good too. At this point our stomachs had reached capacity so we bought the homemade authentic Hungarian strudel from Country Delight in a takeaway box to eat later. They had all different flavours like cherry choc and custard, apricot and cream cheese and the timeless favourite, apple and custard. Surprisingly the strudel made it home in one piece. 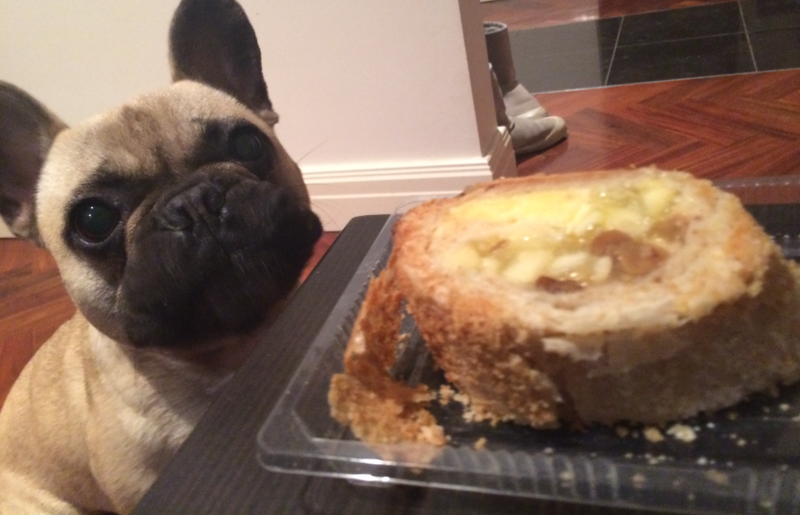 Max didn’t know what a strudel was but he did know that he wanted some. They also had a Wonderbao stall where you could get warm steamed buns. Perfect for a winters night. Yum! These are absolutely delicious every time. Their baos are always top quality. The Gourmet Soup Factory had a stall too, there was a mountain of bread rolls on the table. 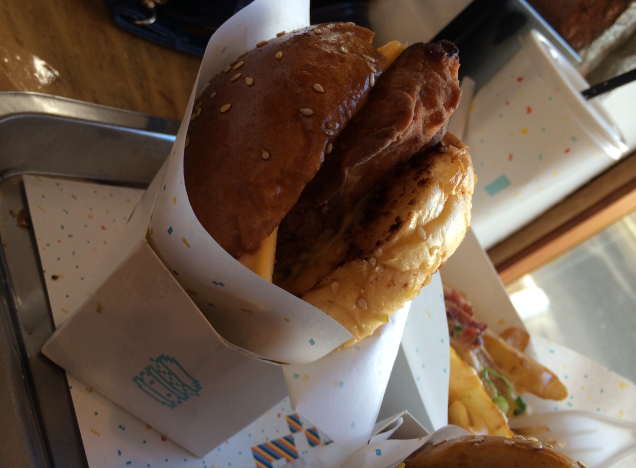 They had a variety of hot hearty soups, which were served inside the big crusty buns. There were so many stalls with lots of yummy food. This was the last market for winter but don’t be sad because the summer night market is just around the corner starting November 5th. 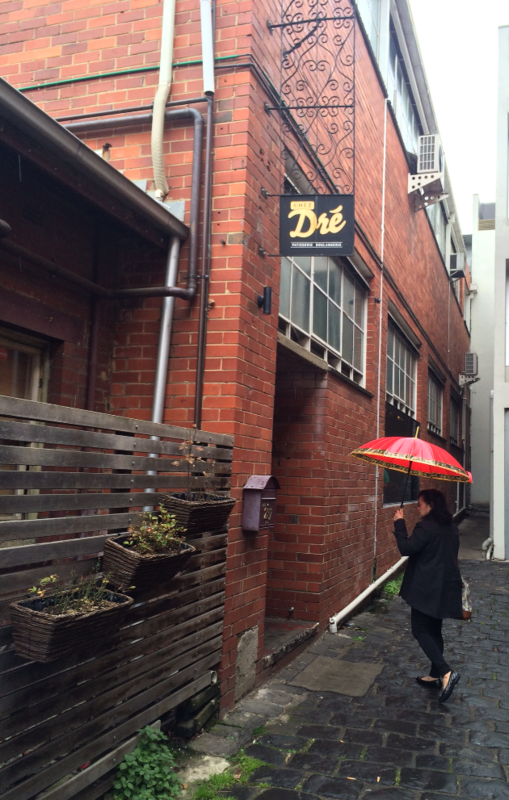 This hidden gem is discretely positioned down a narrow street in South Melbourne. 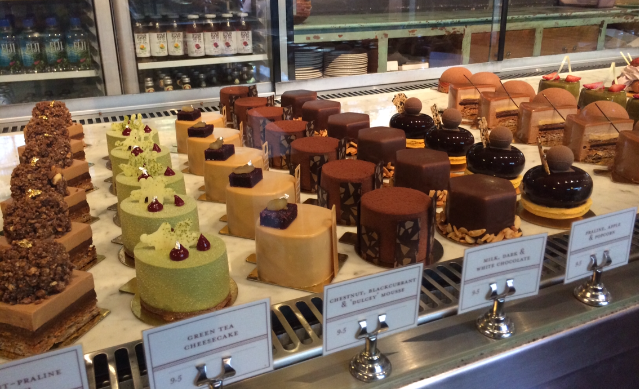 There is an amazing display of cakes, macarons, pastries and baguettes, a patisserie-boulangerie. The décor is chic and takes you into another world. There are big wooden share tables, cute little jars with fresh flowers in them and bright red watering cans against the brick wall. It is a lovely setting to have brunch or to just stop by for a cake or two or three. As you walk in, there is an open kitchen on the left and seating on the right, which then opens into a big seated area with a nice courtyard out the back. The cake display was impressive. I think they were sparkling in the light. They were so super shiny and glossy they looked fantastic. 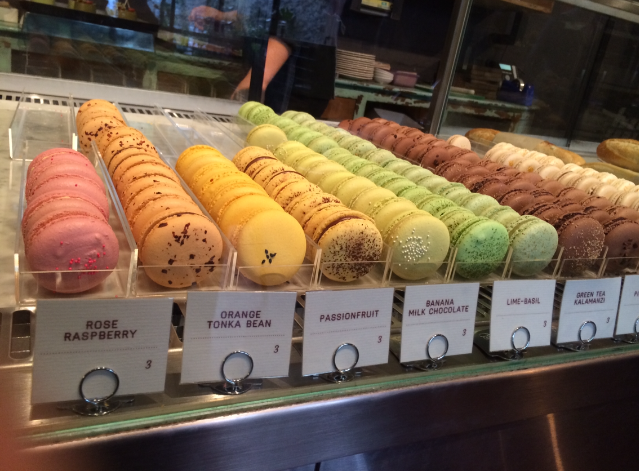 They had some interesting macaron flavours like orange tonka bean, lime-basil, rose-raspberry, apple cinnamon and green tea-kalamanzi. Along with the common faves like vanilla, chocolate, salted caramel etc. 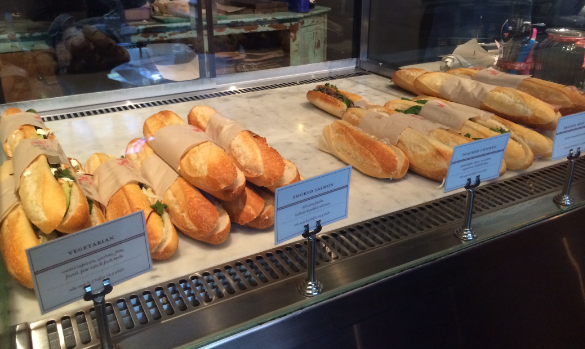 Their assorted baguettes looked really good. They were thin and crunchy and had a good range of flavours. I liked the sound of the poached chicken w apple, capers, cornichons, mayonnaise, witlof & celery mmm. 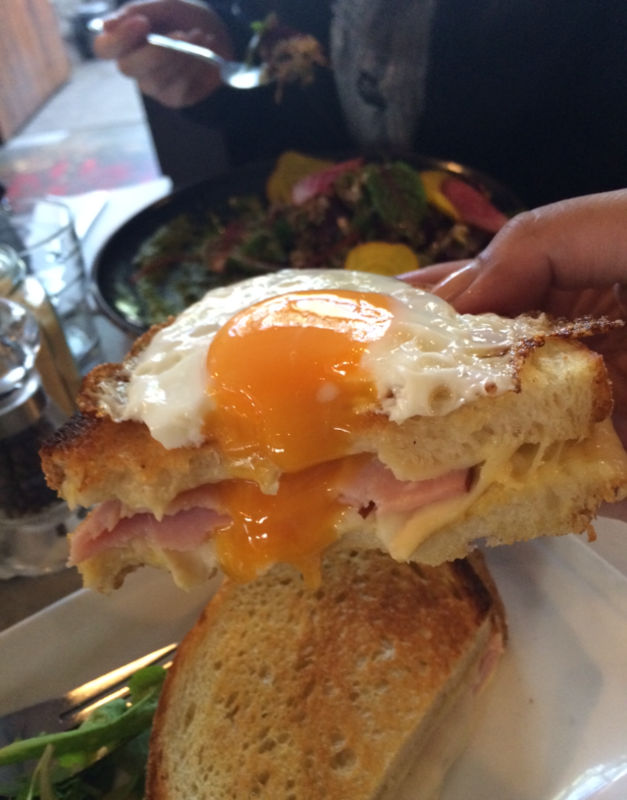 The croque madame was a smoked ham & emmental (swiss) cheese sandwich grilled with béchamel (basically a fancy ham and cheese toasty) with a fried egg on top. It was nice and had a kick of mustard, which went well with the pickles in the side salad. baby kale, green harissa & sherry vinaigrette. The lamb melted in your mouth. It was fresh and tasty. and truffle oil. This was nice, the flavours were good but it was screaming out for some texture like a piece of crusty bread or something. Well actually truth be told, I did have all of my wisdom teeth extracted this week (ouch ouch) and probably couldn’t eat a piece of crusty bread. But unless they had extrasensory perception and knew that my wisdom teeth had recently been extracted (and so omitted the element of texture) then this dish was way too mushy. on sourdough was simple and fresh. 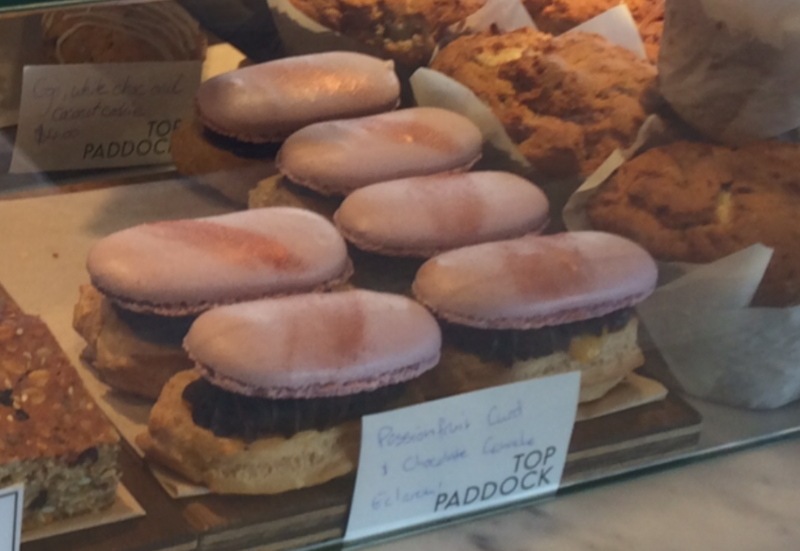 Now for my favourite part of Chez Dre… the cakes! The fruits of the forest st. honoré is delish. It is like three raspberry petits chou (mini profeteroles) with a red fruit chantilly (berry cream) sitting on a lime-vanilla sable (like a round shortbread biscuit). It looked really cute and was yum. 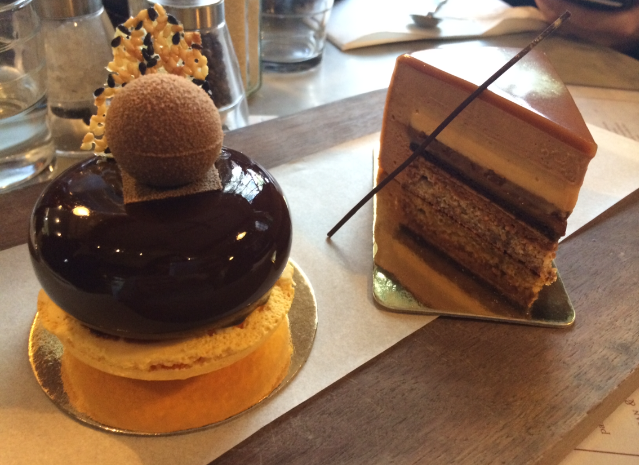 The lemon-hazelnut tart had lemon mousse, praline, lemon crème and a hazelnut dacquoise. It was like a complex lemon tart, it had the familiar elements (lemony and biscuit base) but had extra layers of technique, which made this extra special. Lemon and hazelnut are a perfect pair, who knew. The lychee, raspberry & coconut looked amazing. When you cut into it, there are lots of layers. It had a coconut dacquoise, lime curd, raspberry jelly and lychee mousse. It was feminine and had a beautiful delicate flavour. 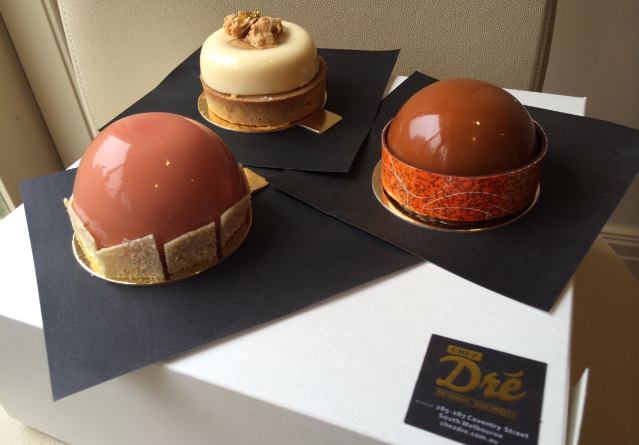 Chez Dre – cakes ready to be eaten yum! 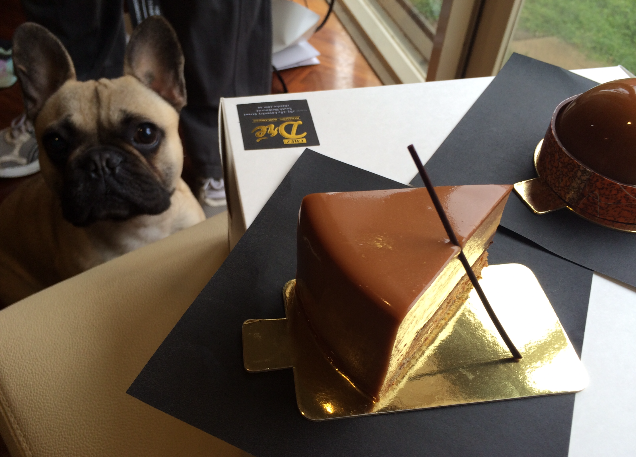 We chose the passionfruit-chocolate mousse because it was the shiniest of all the shiny cakes. 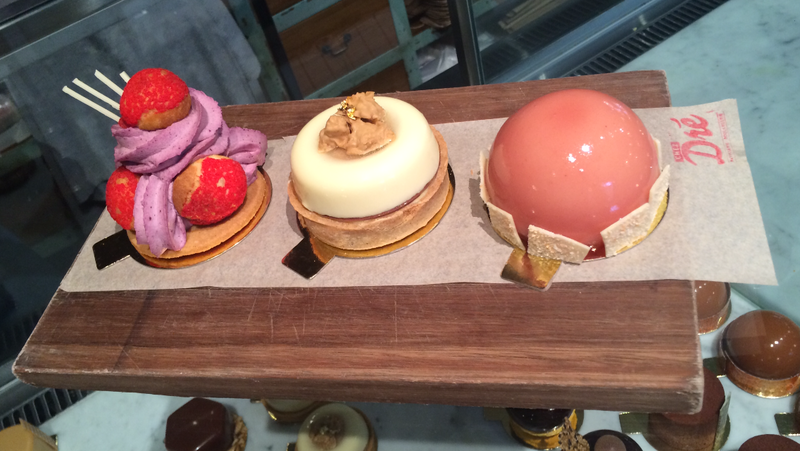 There was a passionfruit macaron shell on the bottom with the chocolate mousse and passionfruit crème. The chocolate mousse was quite dark and had a yummy tropical truffle sitting on top. There was a little sesame seed tuile but I wished it was bigger or there was more because it was paper thin and utterly delicious. The banana caramel slice is absolutely delicious! It has many layers: banana, caramel & ghana milk chocolate caramel bavarois, banana créme, passionfruit ganache, hazelnut-crunch. The banana layer has a marvelous fresh banana taste, which is dominant enough to stand its ground against all the other caramel and chocolate layers. It’s flawlessly smooth but there are also elements with crunch. It was outstanding and definitely my favourite cake. Yum! We took some cakes home for later. They were oh so shiny, the compelling gloss of the cakes turned my hand and forced me to buy more cakes. Well it was either that or that I was lacking restraint. Probably the latter. As usual Max thought the cakes were for him, it was hard to break the bad news. 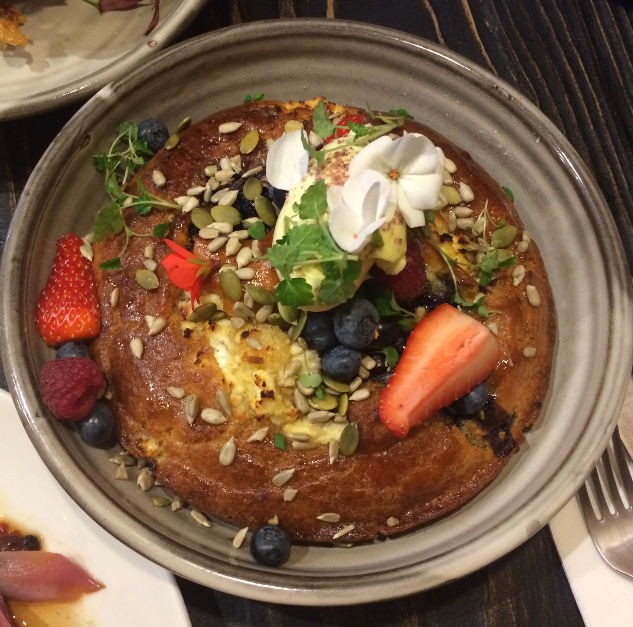 Chez Dre has a great atmosphere, the staff were nice and the cakes were amazing. It’s a good idea to proceed with caution when approaching the cake display because the remarkably shiny cakes may hypnotise you into eating more than you probably should. 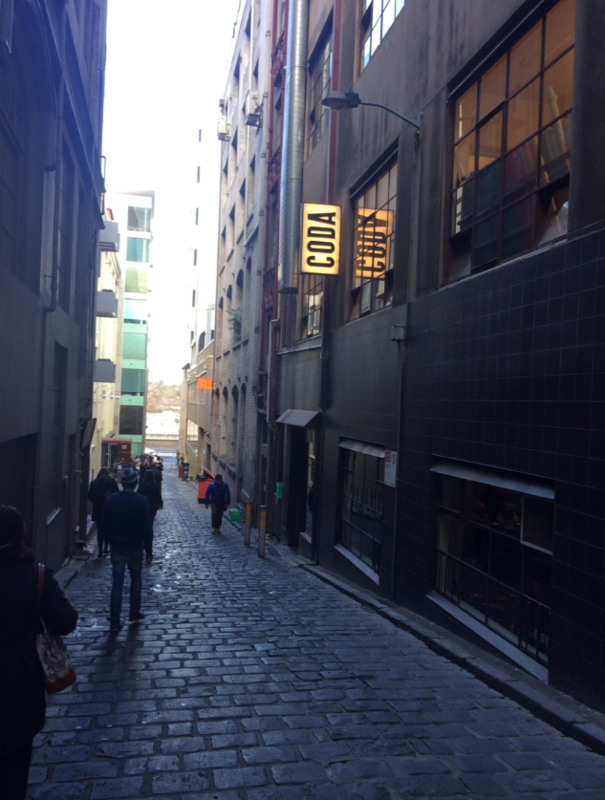 Coda is an amazing restaurant tucked beneath the hustle and bustle of the city. 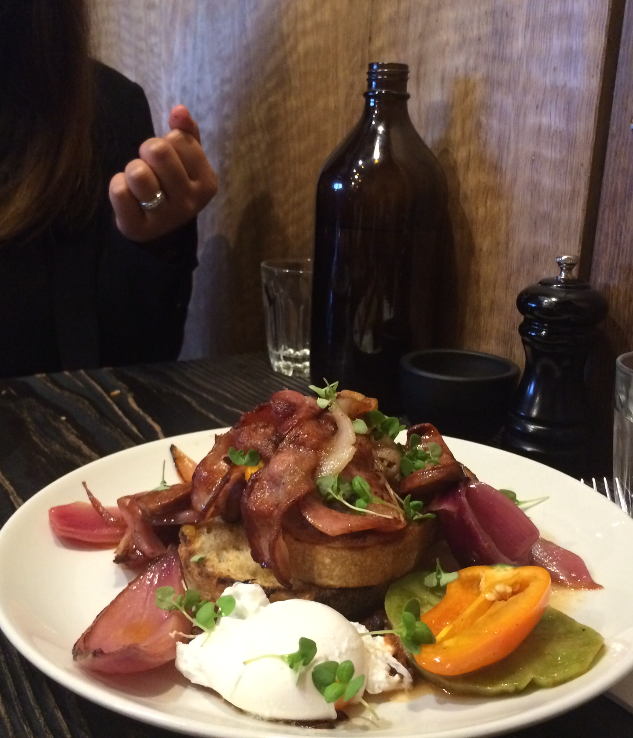 In a basement off Flinders lane, this hidden gem has a sensational menu and provides a memorable eating experience. 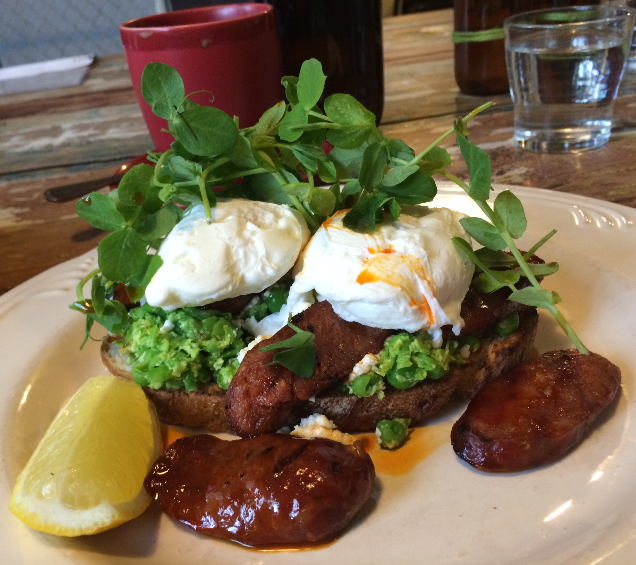 The food is inventive, inspiring and undeniably delicious. 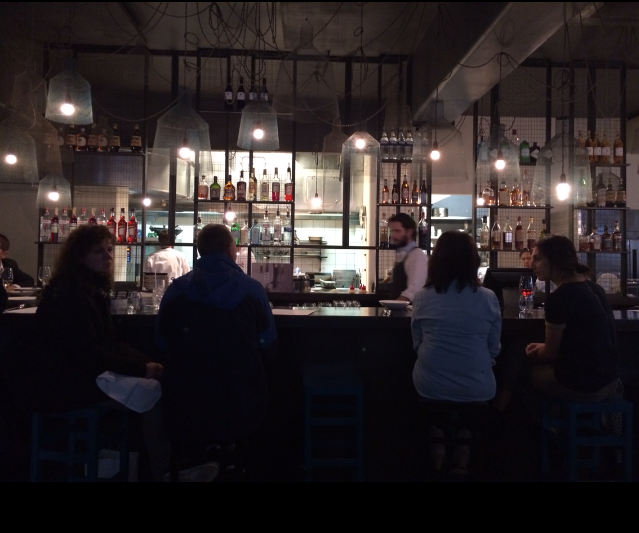 The venue was dimly lit and had an intimate feel and a great wine selection. The service was great, the staff were friendly and attentive. The spanner crab was cold and fresh. It had galangal, roasted chilli, lime and fresh tomato. It was a perfect starter to the meal. 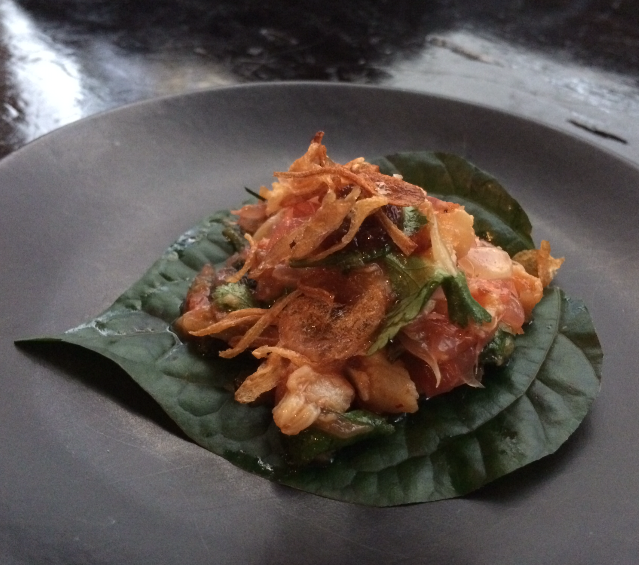 You fold up the lime betel leaf and eat it like a little taco. The flavours were light and refreshing. 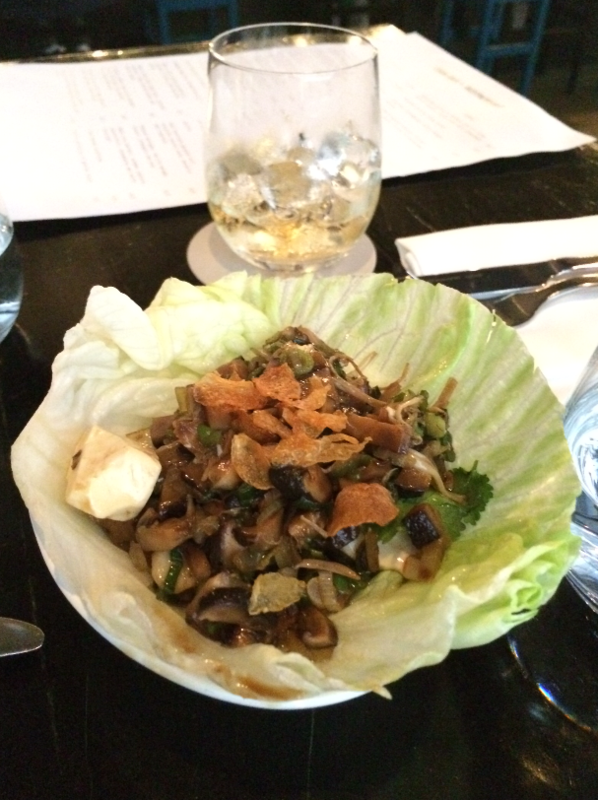 The lettuce delight was nice, it was a san choi bao w eggplant, tofu, enoki mushroom, crispy garlic and black vinegar. 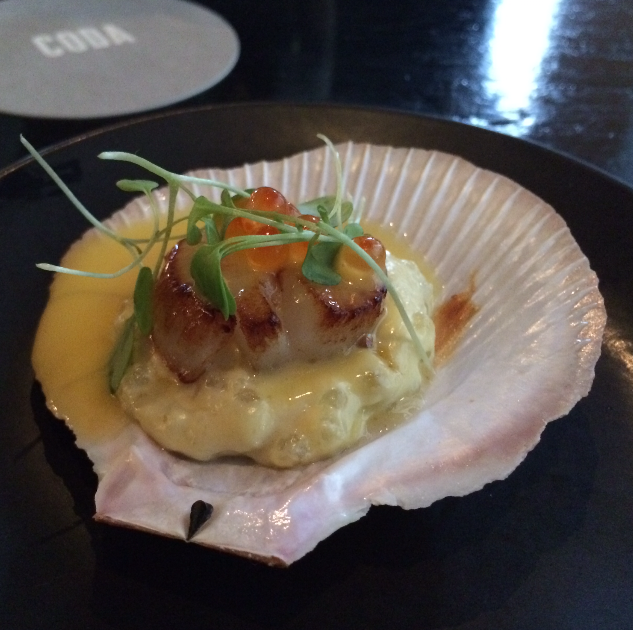 The Hervey bay scallop was amazing. 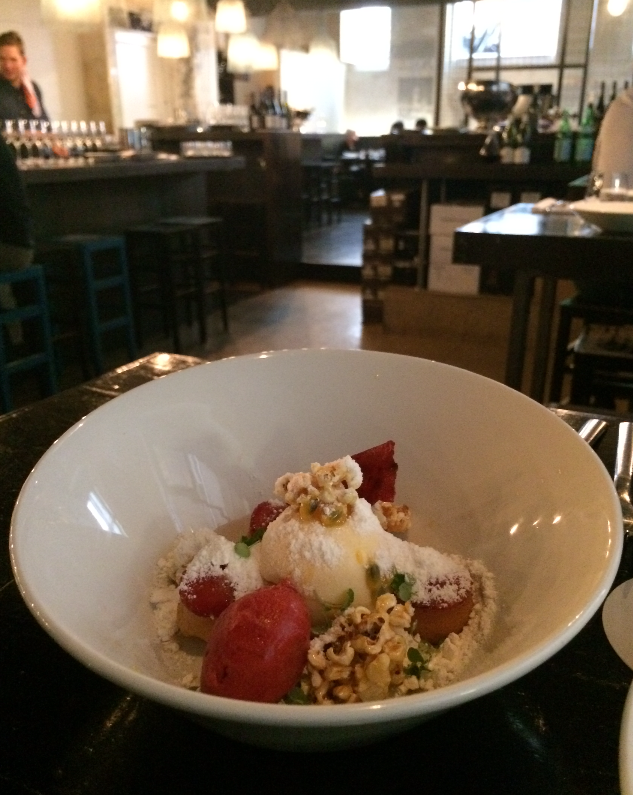 It was seared perfectly and the pearl tapioca was buttery and creamy and had a brilliant texture. It was topped with Yarra Valley salmon caviar. I don’t usually eat salmon caviar because it reminds me of the opening scene of ‘finding Nemo’ but I thought it would be a shame to set this aside because it looked really pretty. Turns out it is delicious! The caviar pops in your mouth with bursts of saltiness it was exciting and absolutely divine. The tempura bugs were lightly battered and cooked to perfection. Simply amazing! I wanted to order more of these, they were so light, tasty and easy to eat. They were paired with a caramelised chilli sauce that had quite a kick and a side slaw. It was delicious! 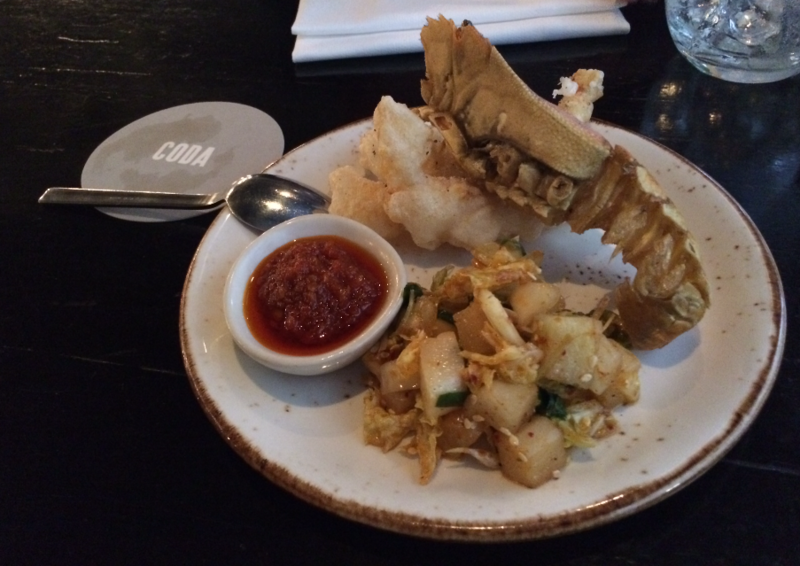 It was presented with the deep-fried bug shell, which was impressive and tasted similar to pork crackling. It was yum! 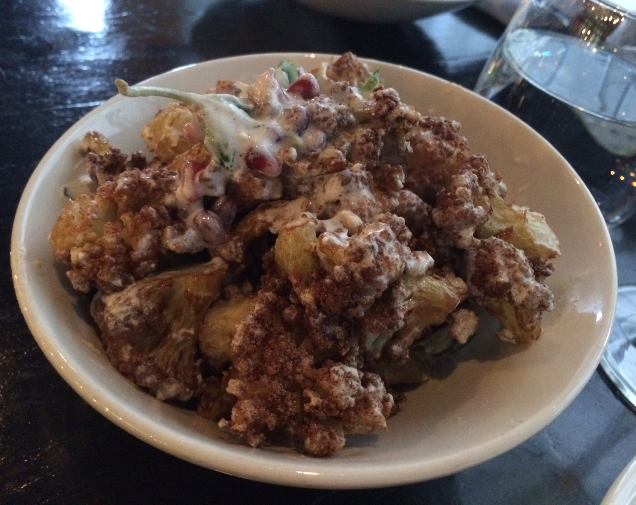 We had the fried cauliflower as a side. It was topped with pine nuts, pomegranate and covered in a goat’s cheese dressing. It was tasty. There were lots of different textures and flavours it was great. 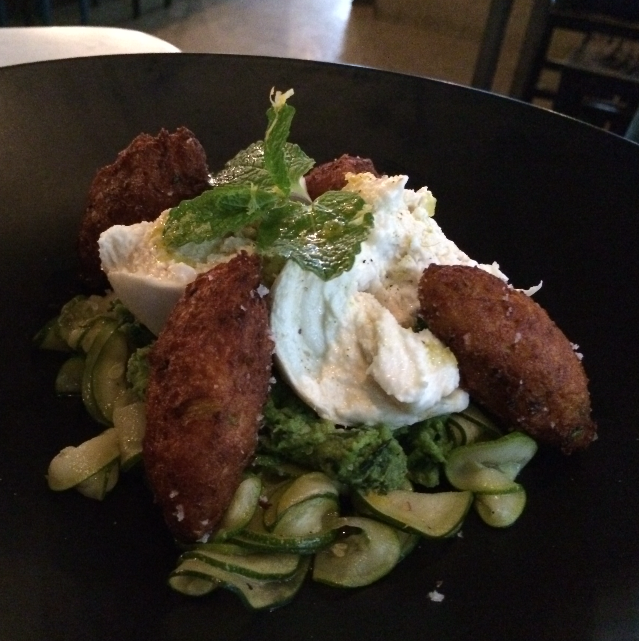 The zucchini fritters were delicious little croquettes, they were creamy and moreish, good comfort food. The simplicity of the smashed peas, pickled shavings of zucchini, mint and That’s amore buffalo mozzarella made this a very sophisticated dish. All the flavours went so well together. 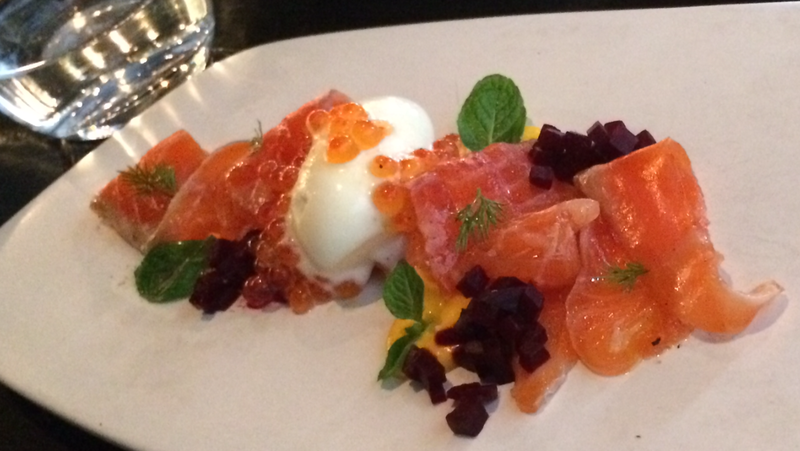 The Aperol cured Huon ocean trout looked like art. 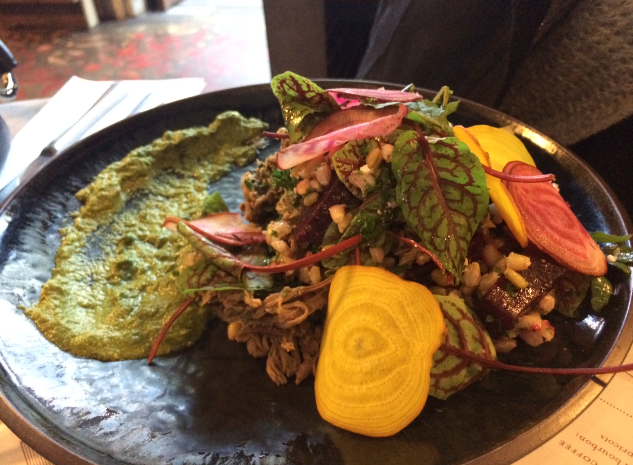 It had beautiful colours and textures scattered across the plate. The pickled beetroot was cut into tiny little cubes. They were so small that they created an interesting texture that really complimented the smooth silky trout. Then there was the perfect quenelle of crème fraiche sorbet and perfectly smooth carrot mousse. Yum! The flavours were amazing. The trout was delicious and the finesse of those tiny beetroot squares made this dish something remarkable. Then for dessert we ordered the sweet corn parfait. There were lots of different elements on the plate. There was caramel popcorn, passionfruit, a bright pink fresh strawberry sorbet and bits of strawberry fruit leather (like roll ups). There were sweet syrup cake balls and white chocolate bits. It was really fun to explore the dish and find surprises of deliciousness. 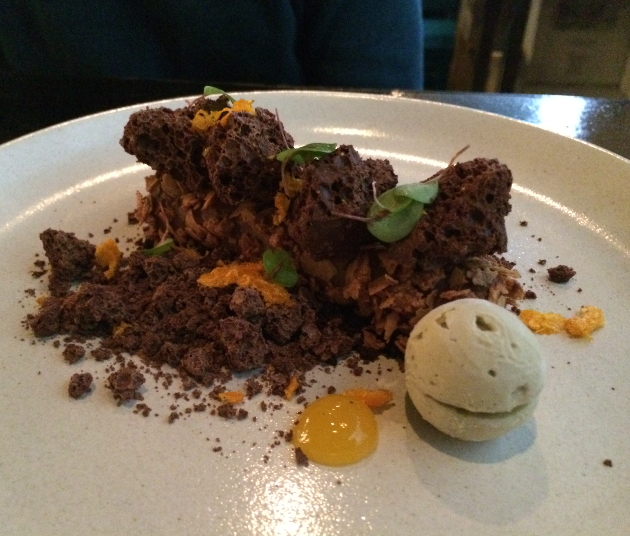 We also ordered the dark chocolate ganache w chocolate crunch, aero, mandarin and licorice. I was hesitant at first because I’m not a huge fan of licorice and it seemed strange to have chocolate, mandarin and licorice. I was wrong. It was delicious. I was going to just avoid the licorice areas if I didn’t like it, but it ended up being my favourite part of the dish. There were little parfait balls of licorice, which were creamy with a really subtle and delicious licorice flavour. I can’t believe I almost didn’t order it because of the word licorice. The licorice parfait was incredible. There was a bar of rich dark chocolate ganache in the middle with big rustic chunks of aerated chocolate sitting on topped, sprinkled with a chocolate crumb, dots of mandarin gel and dehydrated mandarin pieces. The mandarin balanced the sweetness of the chocolate and gave it a touch of citrus. It was sensational. The toasted meringue looked beautiful. It was covered in this white snowy dust. 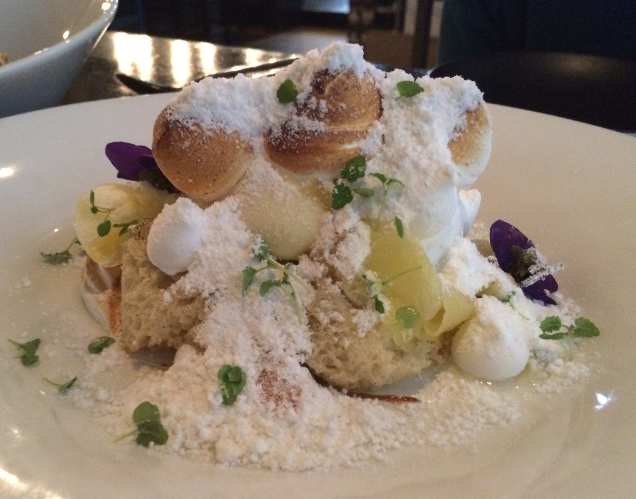 There were big soft peaks of toasted meringue, which had a toasted outer and melted in your mouth. They tasted like camp-fire roasted marshmallows yum! There were also little crunchy meringues, fluffy vanilla sponge, coconut cream, pineapple and yuzu which was really citrusy to cut through all the sweet. It was fantastic. Everything we ate was exciting and delicious. Each meal took you on an exciting journey where you became completely immersed in the dish you were currently eating until the next dish arrived and you became completely immersed in that one. 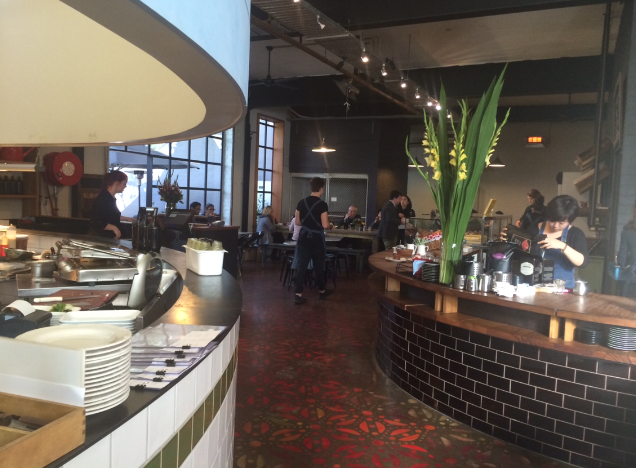 The service was great, the venue had a good atmosphere and the food was outstanding. It was truly an inspiring experience. 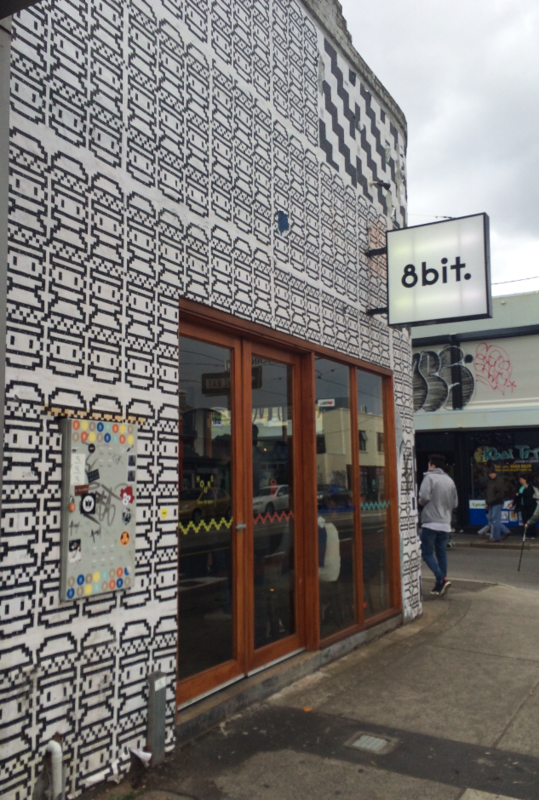 8bit is a burger joint inspired by 8bit games. At the counter they had a Mario stuffed toy, an old Nintendo control, a space invader tips jar and a one up mushroom figurine. A whole lot of nostalgia was going on. 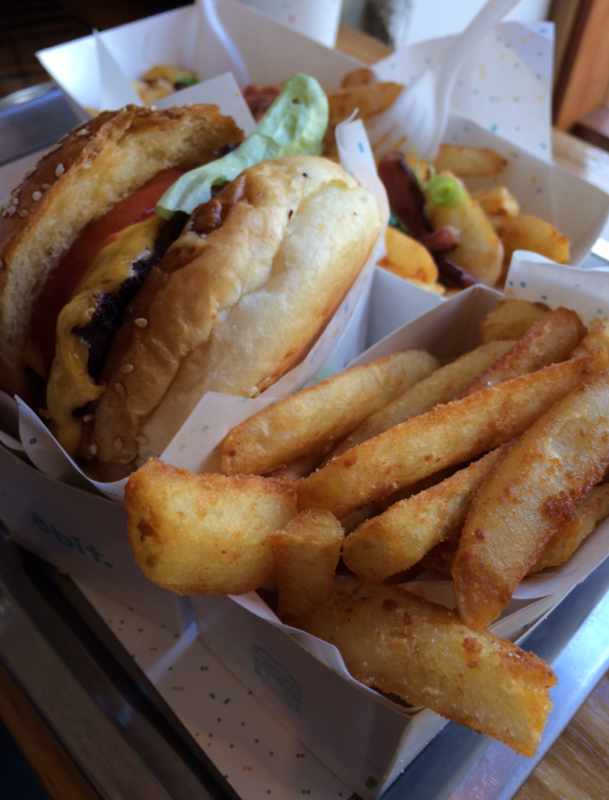 Then they had an American inspired menu with a range of burgers, franks, fries, soft serves and milkshakes. 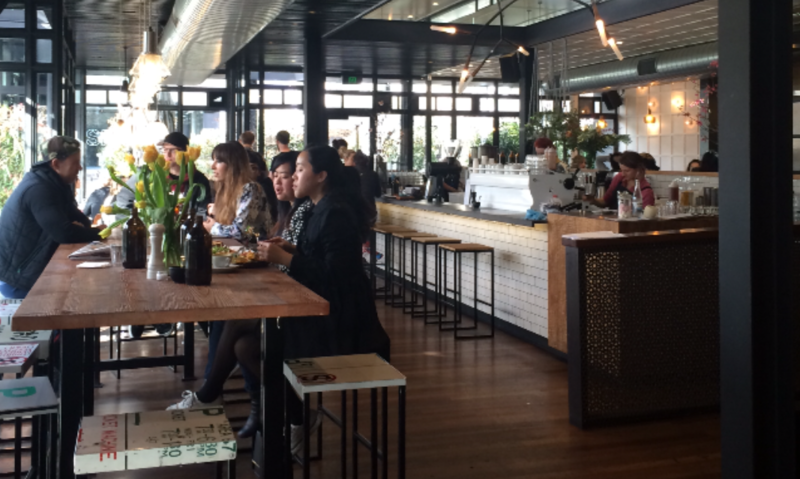 The reminiscence mixed with awesome food really makes this place a winner. The staff wore overalls, with the straps crossed at the back (Mario styles) and the girl at the counter was wearing awesome 8-bit pixel framed glasses. They all fit in with the theme. They had an open kitchen which was tiled with lots of squares just like 8bit games and had little tetris squares of colour which sort of looked like little hearts. 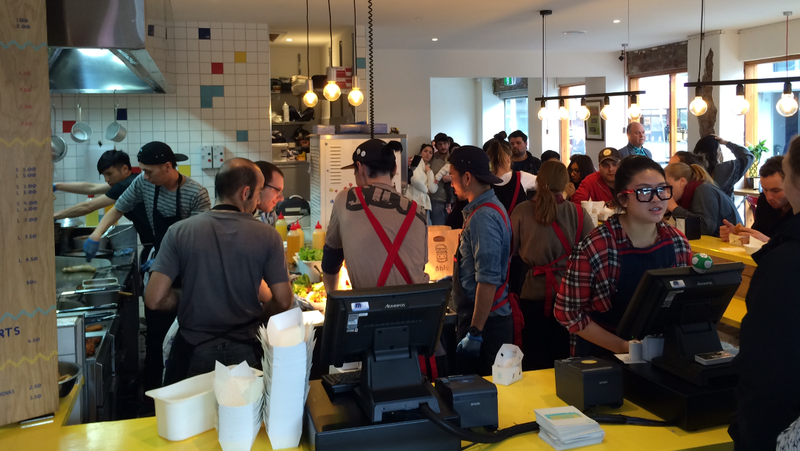 The burgers are named after games like double dragon, golden axe & altered beast. The mushroom burger is called the 1 up mushroom burger (very cute). The table numbers were characters from games, made out of those plastic beads that you iron to stick together. 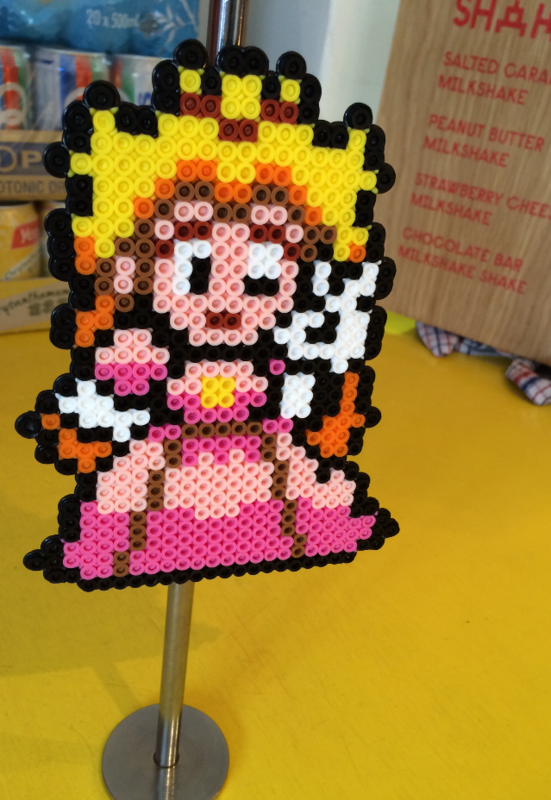 We got princess peach but they had all different ones. I saw astroboy, sonic and even yoda floating around. 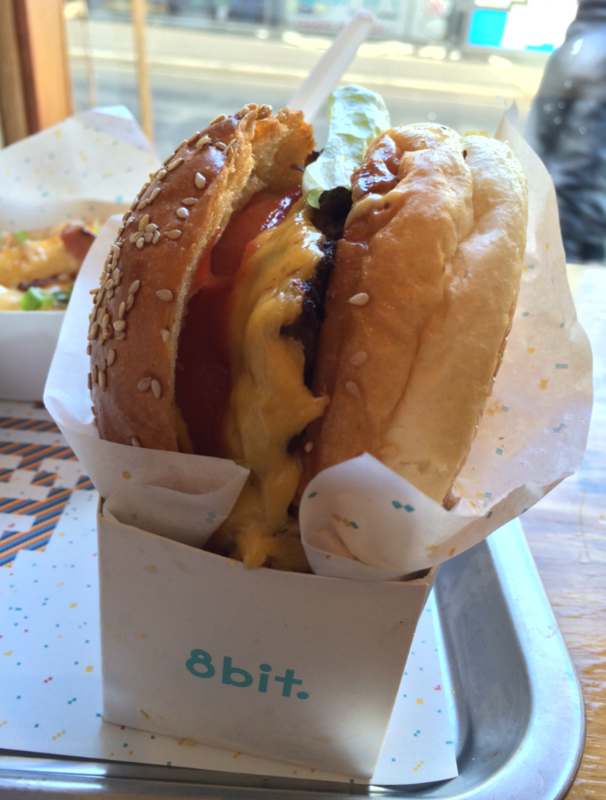 I ordered the 8 bit with cheese, which was a juicy beef patty with tomato, lettuce, red onion, pickles, mustard, 8BIT sauce (which was like a tasty tangy tomato sauce) with melted cheese encased in a soft toasted buttery brioche bun. It was a good-sized burger and each bite was so tasty. It was full of flavour. It was delicious! We also got the Golden axe, which had crispy fried chicken, cheese, sriracha mayo & slaw. That was yummy too. 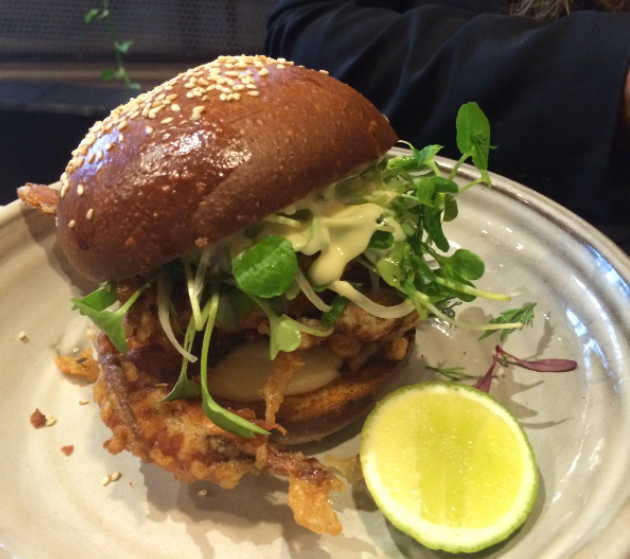 It had a big fillet of crispy chicken and went well with the brioche bun. They also had a range of hot dog options. I want to try the fatal fury, which is like a chilli cheese dog. As a side they had beer battered fries, onion rings and ye good ol’ potato gems aka tater tots. I do miss those little clouds of potato goodness. We ordered the cheese and bacon fries. Wow! These were so delicious I couldn’t believe how good they were. I’d suggest you order these fries with your burger. You won’t be disappointed. 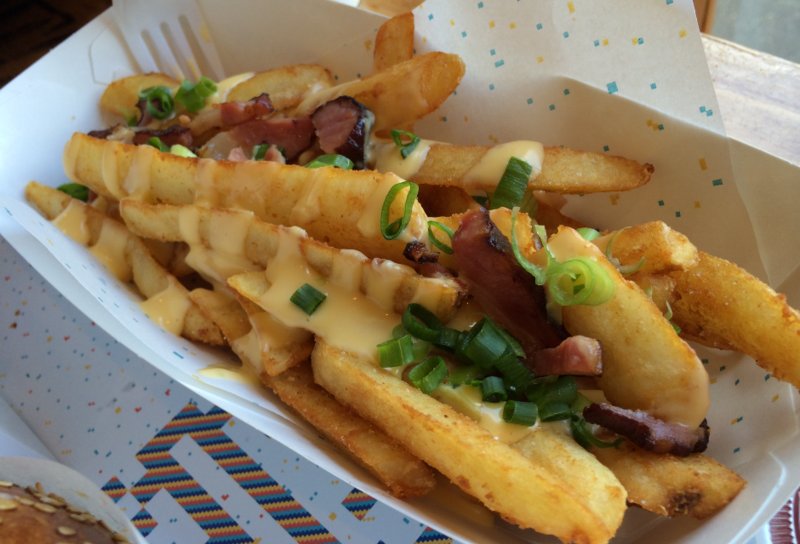 They were thick cut beer battered fries with cheese sauce, big chunky bits of bacon and fresh spring onions. They were delicious!! They also had chilli cheese fries and loaded fries, which I’m confident would be yummy too. The soft serve of the day was strawberry cheesecake. 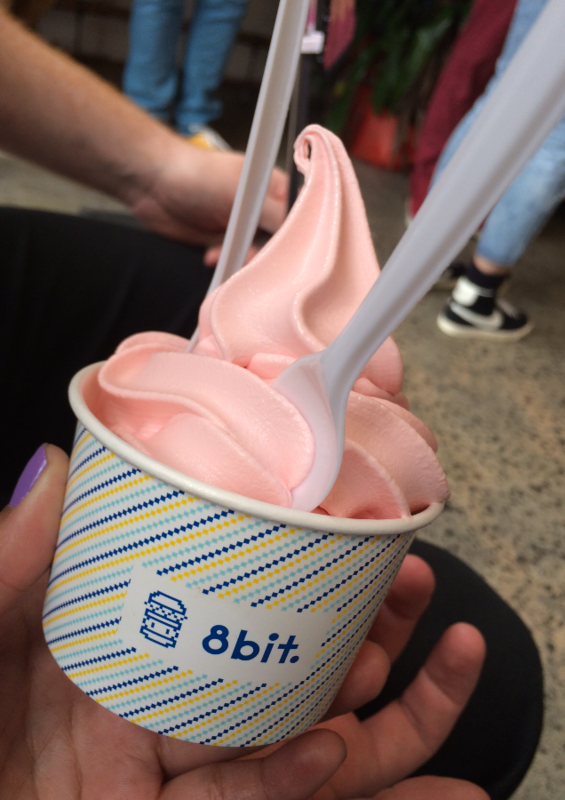 It was soft, smooth and creamy and tasted just like a strawberry cheesecake. The flavour was spot on and the texture was just perfect. We loved the strawberry cheesecake soft serve so much that we ordered the strawberry cheesecake milkshake as well. The strawberry cheesecake milkshake was delicious! The milk shake was thick, more like a thick-shake, which is what I prefer. 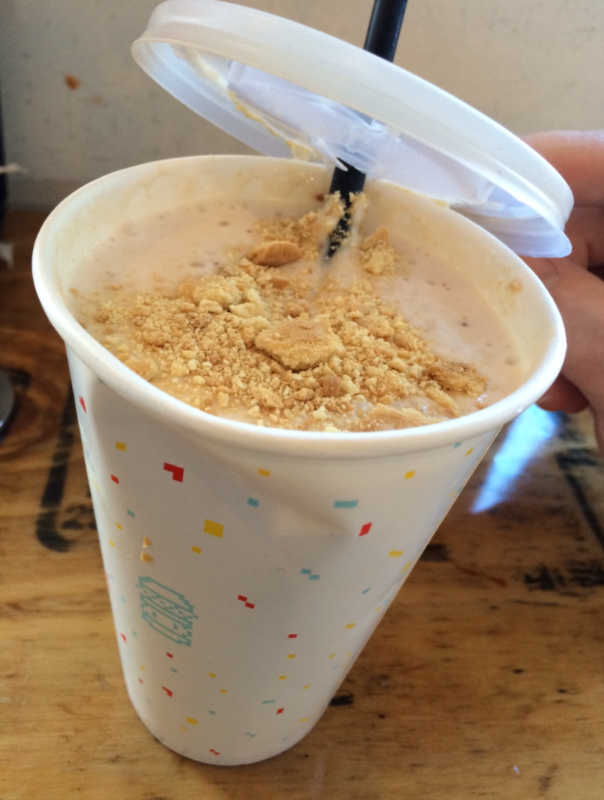 And they even put biscuit crumbs in the milkshake and on top. 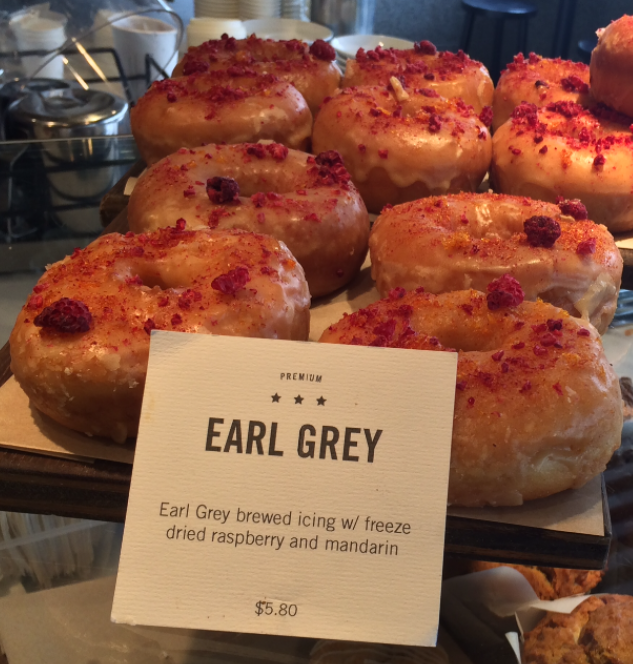 It was so yum I wanted to try all the flavours. They had salted caramel, peanut butter and a chocolate bar shake. This place brought back memories. It made me remember the days when I was inseparable from my SNES (16-bit same same). And also reminded me how much I love the simplicity of a classic burger, fries and milkshake (3-hit combo). The staff were really friendly and informed us before we ordered that it might take 45mins for our meals to be ready because it was really busy, which is nice. It was worth the wait. 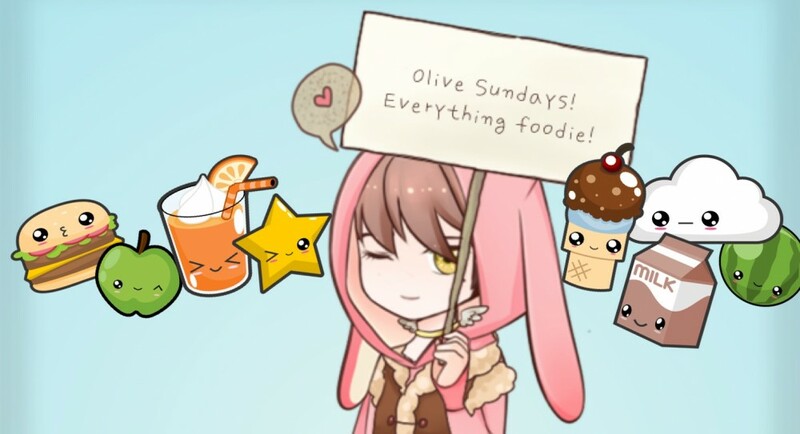 the food is delicious and the diner style restaurant creates a cool and casual environment to catch up with friends and grab a byte to eat. Pizza Capers – The Inferno Challenge. Pizza Capers do a great gourmet pizza but on this particular occasion it was more than gourmet pizza. It was a challenge. The Inferno challenge. So the challenge is to try the new Inferno range at Pizza Capers, add loads of Tabasco sauce like a boss and try not to cry like a baby girl about how hot it is. 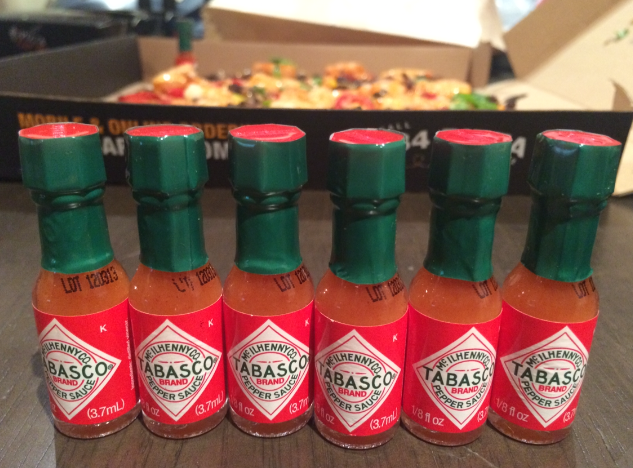 Pizza Capers – The Inferno Challenge – Mini Tabasco Sauce Soldiers. I’m no Dante (The divine comedy) delving into the depths of hell. I’m more just someone who likes a bit of chilli now and then. They gave us a bunch of little Tabasco sauces to add to the already spicy pizza. They were teeny weeny and so adorable but two or three drops for me was enough to make these pizzas too hot to handle. My friend on the other hand is a chilli loving spicy pizza eating machine. 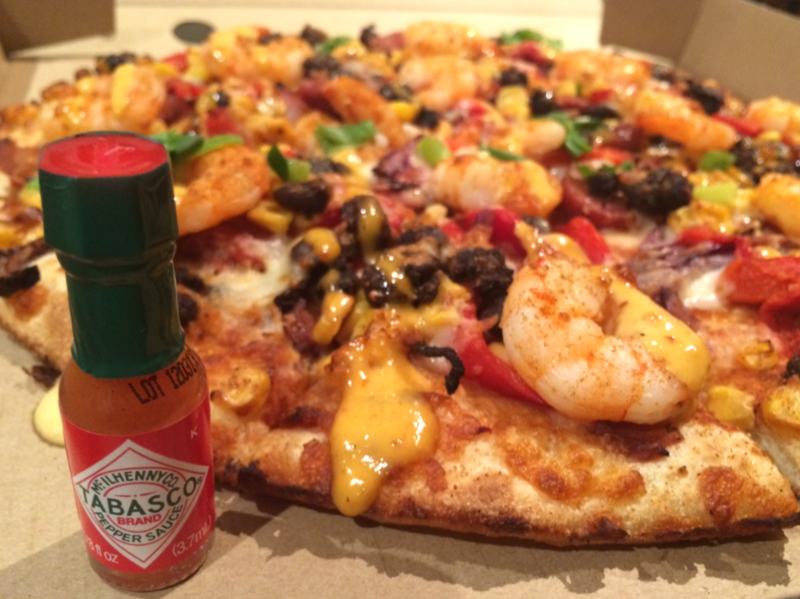 Pizza Capers – The Inferno Challenge – The Tabasco moustache. She was literally emptying half mini bottles of Tabasco onto each pizza slice. 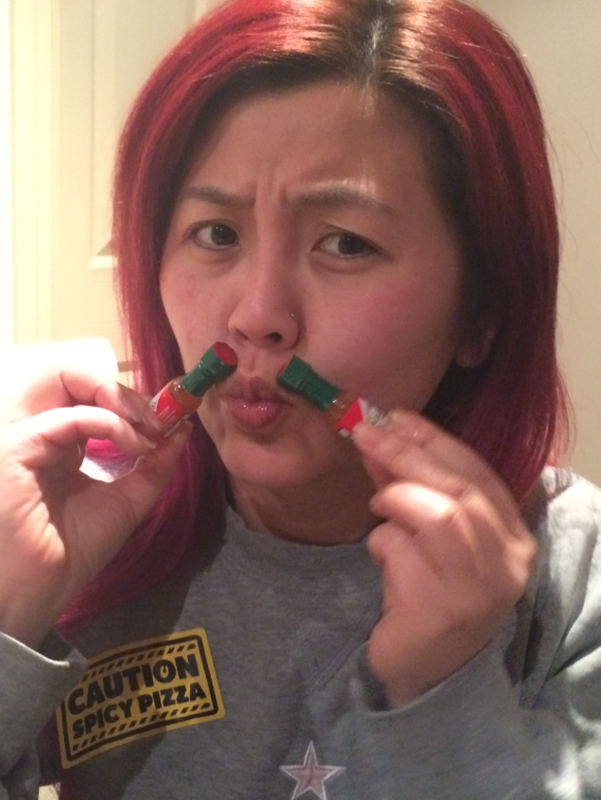 She loves Tabasco sauce. Please refer to the Tasbasco moustache above. You could say she likes it hot. She won this challenge hands down. 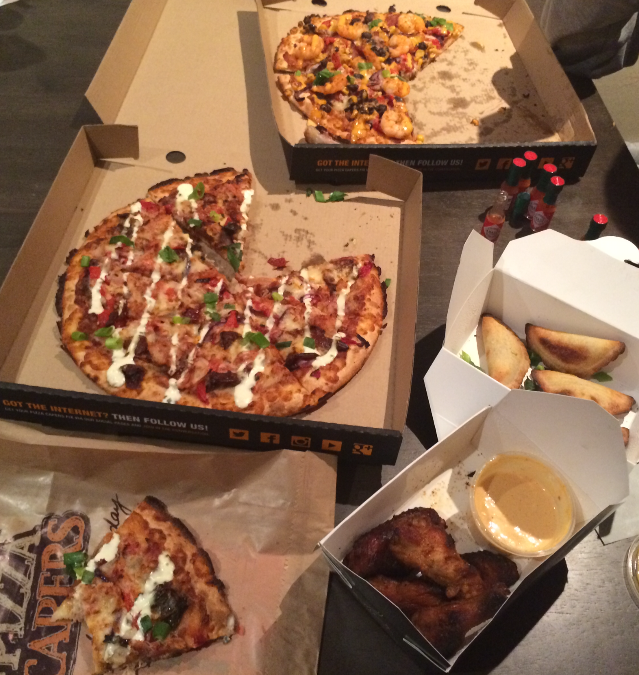 Pizza Capers – The Inferno Challenge – Chimichanga chorizo and prawn pizza. First up was the chimichanga chorizo and prawn pizza, which was really colourful and came with a mountain of topping. There was slices of spicy chorizo, big juicy prawns, hot salsa, smokey black beans, spanish onions, roasted red peppers, corn and melted mozzarella. It was delicious. I loved the fresh spring onions scattered on top. The pizza base was light, which allowed the flavours of the pizza to shine. The generous topping ensured each bite was packed with flavour and more importantly had a spicy kick. Sometimes I felt like I was eating a burrito, other times I felt like I was eating a paella and then sometimes I realized I was eating a pizza. It was a really exciting meal. 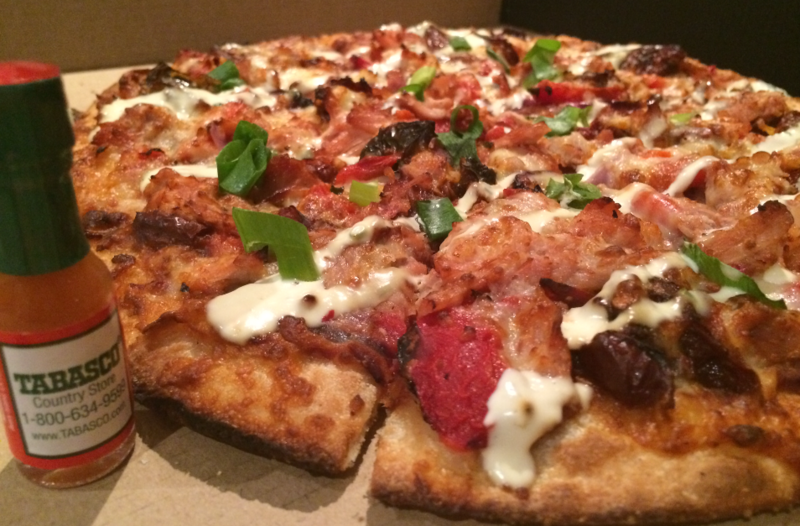 Pizza Capers – The Inferno Challenge – Chipotle pulled pork pizza. The second inferno pizza was the chipotle pulled pork, which had tender pulled pork, fiery red bean salsa, smoked chipotle peppers in an adobo sauce (so hot), Spanish onion, roasted capsicum, garlic and melty mozerella. It was really tasty and really spicy. It’s the kind of spicy that creeps up on you slowly and leaves a lovely hum of hotness in the background of your taste making you want another slice and another and another and then maybe a chicken wing. 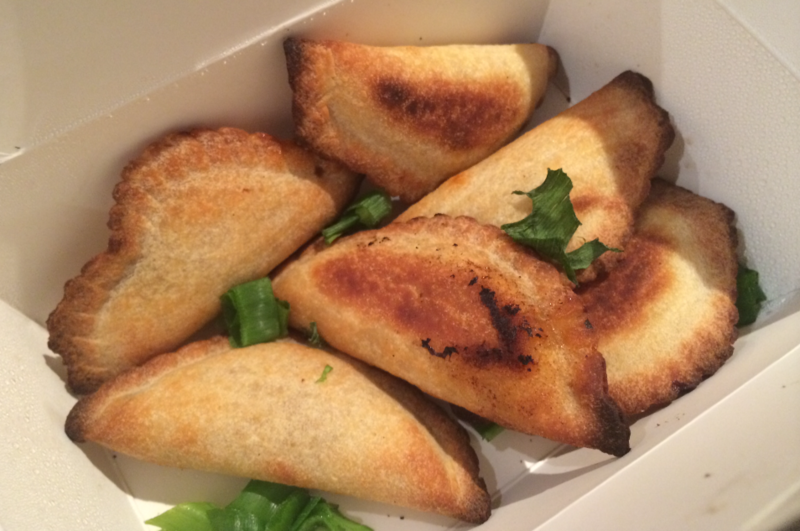 Pizza Capers – The Inferno Challenge – Spicy Empanadas. The empanadas were yummo and stayed within the spicy theme. The filling was good and the pastry was really good. They came with a chipotle mayonnaise, which I have named chipotlennaise, which was delish. It was kind of like Nando’s perinaise but a tad more spicy. It was supposed to be for the empanadas but we used it with the empanadas, we used it with the wings, we used it with the pizza crusts. You could say we really liked it. Pizza Capers – The Inferno Challenge – Pups be Plotting. 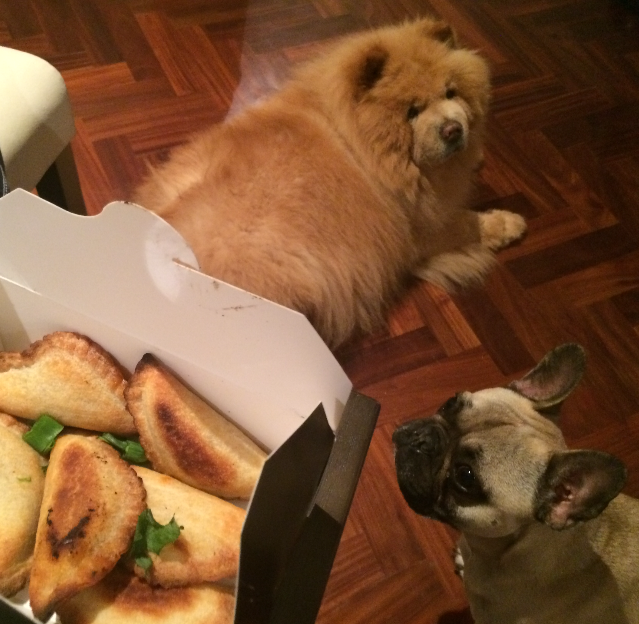 Here is a pic of Max (the Frenchie) and his friend Joy (the Chow-Chow) plotting ways to get those empanadas from the table to their mouths. Unfortunately they were unsuccessful. 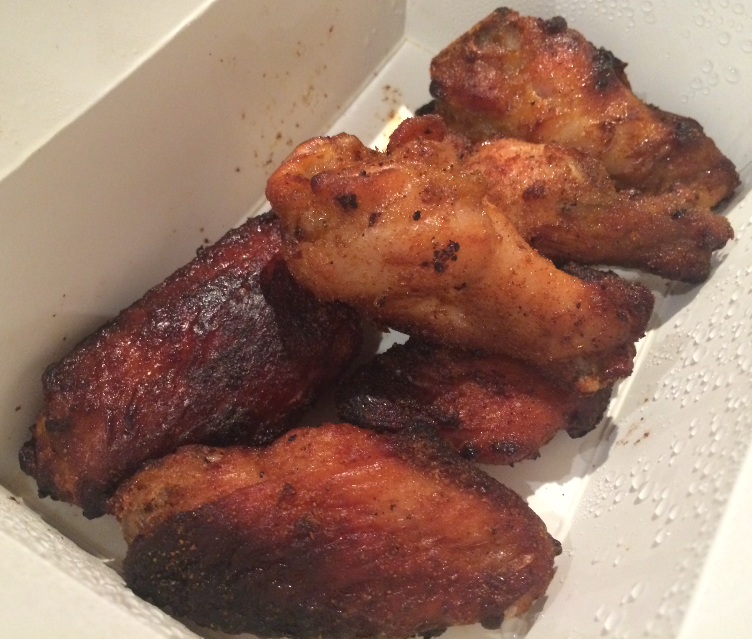 Pizza Capers – The Inferno Challenge – Inferno Wings. The inferno chicken wings/drumettes were nice. I thought I would eat the chicken wings as a respite from the heat. Wrong! They don’t call them inferno wings for nothing. By this time I was certainly feeling hot hot hot. This inferno range is only around for a limited time, until the 31st of August to be exact. So if you like it hot, make sure you pop down to a Pizza Capers near you and attempt the inferno pizza challenge if you dare. Would I try it again? Si senor.